This is another Christmas Memory, inspired by The Artistic Christian’s Christmas Memory Giveaway. It’s a completely true story of what happened to my family just two Christmases ago in 2012. The chiming of the doorbell broke the silence of the night. Jon and I looked at each other in surprised alarm, and then our eyes instantly went toward the clock on the wall. It was nearly 10 pm. Until the doorbell interrupted us, Jon and I had been talking as we in the soft glowing light of the decorated Christmas tree. The kids already been in bed for more than an hour, but preparing for Christmas morning hadn’t taken us any time at all. There were no toys to put together. 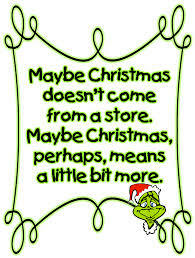 No mountains of presents to bring out of hiding and place beneath the tree. No items to be sorted and carefully stuffed into stockings. It had been a hard year for us financially. As always, God had provided for every need, but now at the end of the year there was very little left in our savings. Jon and I were determined not to use credit as we were working diligently to become debt-free, but that meant a lean Christmas budget. In fact, all total, we had just $60 to spend on our kids. Divided equally among the five kids, it meant I had just $12 per child with which to buy gifts and fill stockings. As a Christian, I already knew this truth, and yet how easy it was to get caught up in all the hoopla of wanting to give my children the typical materialistic American Christmas. To add more fuel to the fire of my worried state, I knew that our five children would receive several gifts from their other parents that were bigger and better than anything I could have afforded if I had spent $60 per child instead of just the $12 I had in my extra-small budget. So I asked the Lord to help me use that $60 to give my family a real Christmas to remember and not to feel jealous when faced with the financial bounty I would see all around me during the season. Almost immediately, an amazing plan began to fall into place, creative and simple and focused completely on Christ instead of presents. Instead of dreading Christmas morning and fearing looks of disappointment on my children’s faces, now I was excited and eager to watch them experience the Christmas that God was planning for us. One idea came from my good friend Christie, who makes Sonshine Boxes to cheer up friends. She wraps small trinkets and labels them with Bible verse clues. So I did the same thing. I found some fun treats at the dollar store, and spent hours looking for the perfect verse to be the clue for each item. On Christmas morning, the kids would play a guessing game, reading aloud the verses and and trying to guess what was inside each gift before opening it. The gifts might be small, but I knew my children would have such fun trying to figure out the prizes. Another idea that came to me had to do with Christmas picture books, in particular a book called Oranges for Frankie (by Patricia Polacco) and The Candymaker’s Gift (by Helen and David Haidle). In the first book, a boy name Frankie loses his Christmas orange and what his siblings do next is simply touching. The second book explains how various traits of candy canes can remind us of Jesus and the Christmas story. We already owned copies of both books, but as a special surprise I bought a chocolate orange and seven nice, fat candy canes. On Christmas morning, I would read the books aloud to the family while we all enjoyed the candy treats. Finally, instead of filling our stockings to the brim with chocolate kisses and other small trinkets, a terrific idea came to my mind. The week before Christmas, I gave each person in our family several sheets of paper on which I had written: “If I could, I would buy you something good!” I asked each one to think of a special gift they would buy for every other member of the family. On the paper, they could draw a picture, write a note, or paste a magazine clipping there to communicate what they would get for the other person. All through December, I prepared for our simple Christmas with an excitement in my heart. I just knew that God was going to bless our hearts in a big way, and I was eager to share it with my family. Soon it was the night before Christmas. After a simple supper, we read the Christmas story from the Bible and sang a few of our favorite carols. By 8:30, all of the children were tucked into bed. All there was for me to do was fill the stockings with the paper notes, set out the two picture books and the basket of candy canes, and set the small trinket gifts which I had already wrapped and labeled with the Bible verses under the tree. Now, all the Christmas morning preparations were complete. Suddenly, the old fears of not providing a typical Christmas for my children began to flood my mind. As I sat next to my husband in the stillness of the Christmas Eve night, I felt lost in the glow of the lights on the tree and the growing apprehension in my heart about how my children would receive the meager Christmas Jon and I had to offer them. Jon carefully peered out the window, but in the darkness he couldn’t see anyone at all. Cautiously he opened the front door. There was no one there. “Perhaps they went to the side door, Jon,” I suggested. Quickly we walked toward the other door. Again, Jon peered out, but again there appeared to be nothing but darkness. Opening the door wider, he stepped out onto the carport concrete … and that’s when he noticed it. Several extra large gift bags overflowing with presents. Once again, my husband and I looked at each other bug-eyed. What on earth was this? “Do you think perhaps someone delivered these gifts to the wrong house? I asked. Quickly, Jon and I sorted the gifts into piles. There were a couple of gifts labeled as family gifts, along with a present for Jon and another for me. 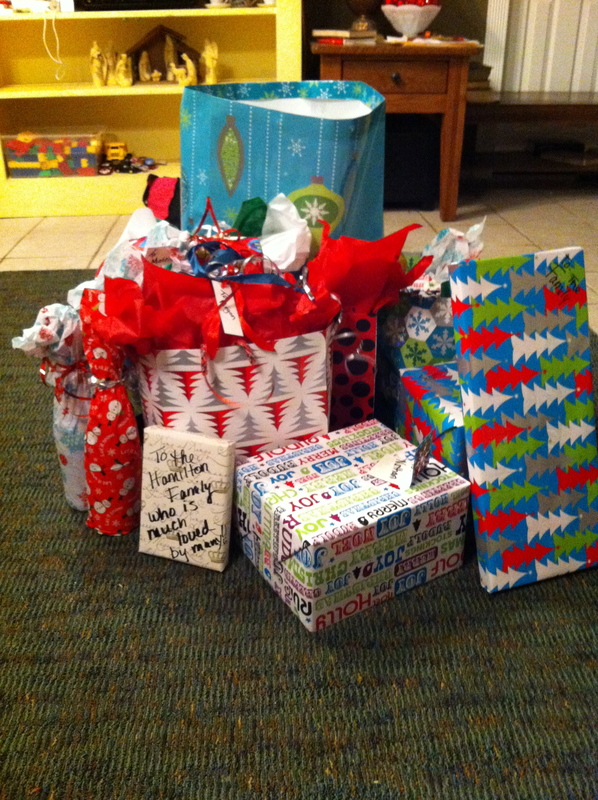 Each child had a stack of five gifts … well, for every child except for Nathan. He didn’t have anything. “Do you think our secret Santa forgot about Nathan?” I felt panicky. This time, Jon made a mad dash for the door, hoping to catch our family’s secret Santa … but again there was nothing. Nothing, that is, but a large bag filled with exactly five gifts, all labeled for Nathan. It was early the next morning when the kids woke us up, eager to see what Christmas surprises lay in store. As we led them into the living room, a gigantic pile of gifts sat in the middle of the room. A collective gasp rose from the kids. “But I thought you said we weren’t going to get a lot of gifts this year!” Julia protested. Jon and I retold the story. Then before we dove into the unexpected gifts, we went through our Christmas morning plan … playing the guessing game with the small gifts and Bible verses, reading the picture books and enjoying the candy, and oohing over the stockings filled with sweet notes from our family. Already our hearts were full, and yet we knew that through a friend God had provided even more for us to enjoy on the blessed Christmas morning. As we opened our unexpected gifts, each one seemed to be perfectly chosen for the recipient. To this day, we have no idea of who brought us the Christmas Eve gifts … but we remember how loved we felt by our special friend and by our Heavenly Father, who indeed answered my prayers and gave us a $12 Christmas to remember. What a sweet memory, and what a sweet friend! 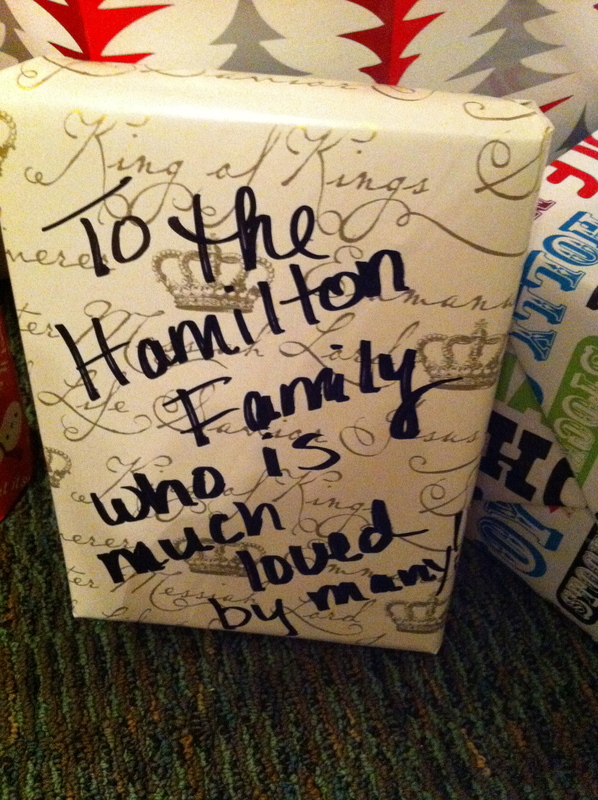 I love the idea of giving Sonshine boxes… I’ll remember this one for future reference…. thanks for sharing this story with us all! The Sonshine Boxes are amazing, too. I’ve been a recipient of one of those as well … in fact, it was through one of the Sonshine Box gifts that I received my life’s Bible verse and my official invitation to write for God. Pretty neat! I think the unexpected kindness of my unknown friend continues to touch my heart to this day. One thing is for sure … I’ve been more giving ever since. What a heart warming story of what Christmas is all about. I loved it thanks so much for sharing it with us. It’s definitely one of my favorite memories to share year-round, but especially at Christmas. Paige – congratulations on winning the Grand Prize for my Christmas Memories Giveaway! If you’ll e-mail me at theartisticchristian@gmail.com and let me know which mailing address to use, I’ll get your book in the mail. Thanks again for participating in the challenge! Wow! What a wonderful surprise to find today! I’m excited to have won, but the real fun was in reliving the memories as I wrote about them on my blog. 🙂 Thank you for the great contest! Oh my goodness- this one brought tears to my eyes! What a treasure your family received that night!